This is one hard to eat burger, but it is so tasty! I like to keep the ingredients for this burger in my freezer and pantry as it really is so fast to prepare and it is always a pleaser. Mix together well and pour over 4 chicken breasts. Marinade for at least an hour. BBQ chicken, using the sauce as a baste and remove to a foil lined dish to keep warm while you assemble the rest of the burger. In a nonstick fry pan over medium heat saute pineapple in the teriyaki for about 10 minutes. They will get alittle bit stick as they almost caramelize. Broil the bread until the butter just start to melt. Remove from oven and spread with mayo. Place 4 slices of cheese on each side of bread and broil until cheese is really bubbly and bread is toasted. Place paper thin slices of red onion on top of the cheese on the bottom part of the loaf and then add your chicken and pineapple. To serve put the top part of the loaf on and slice wide pieces. Try to pick it up and eat it, but you may need a fork and knife. I like to serve this with California Salad. I'll post that recipe soon. I found this recipe in the Robin Hood Baking Festival cookbook although I did change it up a bit. It is a moist and flavourful cake much the same texture as a carrot cake, that is great for lunches. with a cream cheese icing or a dusting of icing sugar. Cut unpeeled orange into pieces, removing seeds. Combine orange, banana and raisins in food processor and chop fairly fine. Combine flour, baking soda, spices and salt. Set aside. 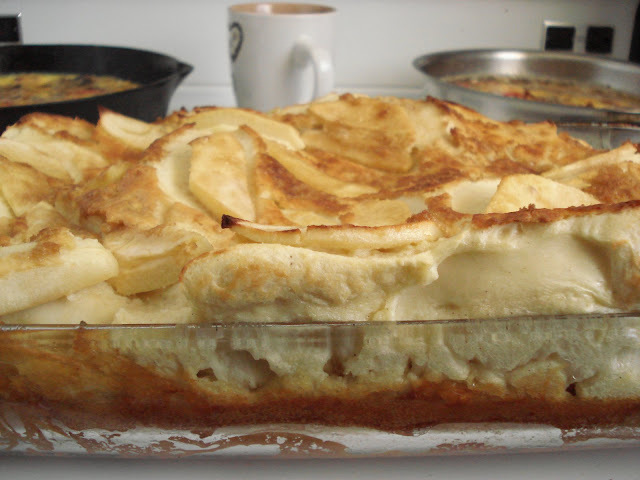 In a large bowl, cream together shortening, sugar and eggs on high speed until light and creamy. Add dry ingredients alternately with buttermilk and vanilla, mixing lightly after each addition. Spread batter evenly in a greased 9 inch square pan. Bake at 350 degrees for 50-55 minutes or until toothpick inserted in center comes out clean. I love a good cookie and this one has been declared (by a variety of 'experts' ) 'VERY good' - they disappeared in record time from the plateful served to non-Celiac as well as Celiac guests. In large mixing bowl, cream butter and shortening, then add eggs, sugar, vanilla and beat well. These are so good out of the oven, but they also freeze well. I found this recipe for a breakfast casserole in an old 'Woman's World' magazine. The recipe claims that it tastes like the McDonald's McGriddle sandwich. I had planned to post a special cake for someone very special today but then decided I'd rather 'invite' her to brunch and make this strata. So Lovella this one's for you. 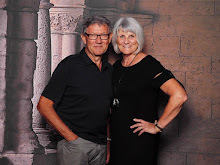 You are celebrating your 50th today and I want to wish you a very happy birthday! You have been an inspiration to me, you set a good example to many. I love your enthusiasm for life and how you express love for God, your beloved, your children, your grand babies and your friends! We have never met in person but I count you a true friend. Seems like a long time ago that I googled 'Paska' and found much more..I found the recipe and a friend! Wishing you God's blessings today and keep celebrating! Beat eggs with milk, stir in cheese and salt and set aside. Cook the sausages and the pancakes. Arrange half of pancakes in bottom of a greased 11" x 7" dish. Top with sausage patties. Pour egg mixture over the patties and top with the rest of the pancakes, gently pressing them into the egg mixture to partially coat them. Cover with foil and bake for 30 minutes at 350º. Uncover and drizzle maple syrup over the egg mixture which has started to set at this point. Continue baking uncovered for another 30 minutes until set. Drizzle with more maple syrup if you prefer. Pizza is something I have missed eating since I have been gluten-free! I finally have a recipe that is good enough to serve to guests -- Regular guests..not just Celiac ones ! 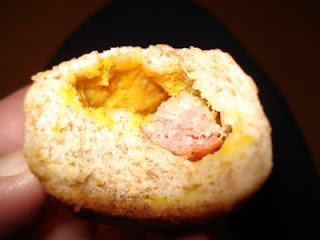 It has a crisp outer crust and soft inside. This dough smells soooo good baking !!! mix all dry ingredients together well -- then add to liquid in mixing bowl. mix until blended , then turn mixer on high and beat for 4 minutes - you will see the Constancy of the dough change. The dough will be sticky, but using a spatula turn it out onto a clean surface sprinkled with sweet rice flour (or tapioca starch) Using as little flour as possible knead the dough gently until you can handle it . It will be a very soft dough. 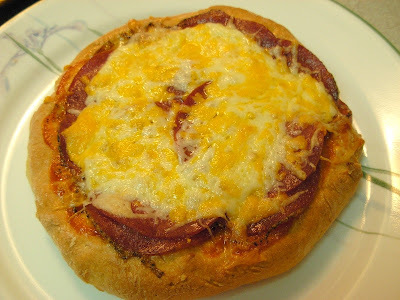 Using your hands form it into a pizza shape, making the edges higher and thicker. I find it easier to make individual pizzas rather then one big one -- but there is no reason why you can't make your pizza any size you like. place pizza crusts on pans and let rise in warm place for about 45 minutes. When pizzas have risen, bake at 350' for 20 minutes. Remove from oven... spread with pizza sauce and desired toppings and bake at 400' for another 20 minutes. Ribs must be on the menu in a few of our kitchens this week. Judy posted a delicious looking rib recipe this past week as well. Here is another melt in your mouth rib recipe. I often add 2 boneless skinless chicken breasts cut into 2-3 pieces each to the pan during the last hour of cooking. This is so simple, but I guarantee they are so tender. You can easily half or double this recipe. Stir together remaining ingredients and pour over ribs. Turn heat up to 350 and remove foil. If there is allot of grease at this point spoon some of it off, but don't take out any of the BBQ sauce. Continue to bake for 1 hour. Baste half way through. If meat is getting too dark cover loosely with foil for last 20 minutes. Some good sides: baked beans, coleslaw, fries, cornbread. Have you ever caught yourself in a pinch? I thought..Hm...what can I send along to the city? while my day was packed with a flurry of celebrations. I knew she was having a party with friends. Well I began scrambling...cake was baking while I was out walking. Cake and pudding cooled while lunching out. Came home and quickly assembled the layers. Ready for three o'clock pick-up. Off to the game I went. Surprising how we can work under pressure. I'm always thankful when I have the right ingredients on hand. I have a friend and she helps me along. I store her in my pantry. She only comes out in a pinch. Cut cake into bite size pieces. Make chocolate pudding according to directions on package. I didn't have Mousse in the house, so I used chocolate cooked pudding. Did you know that you can buy Skor Chipits? I could already see quite quickly, that this was a large recipe. So, I decided to half it and put it in s smaller bowl. Layer with whipping cream or Cool-Whip. Drizzle the crushed skor bits on top. Yummy, can you see the chocolate pudding? Throw the nuts on top! Drizzle the caramel topping and you are set to go! It's more advisable to chill for several hours. They are still ramping and raving over it. Now I have just enough left for a small dinner company! 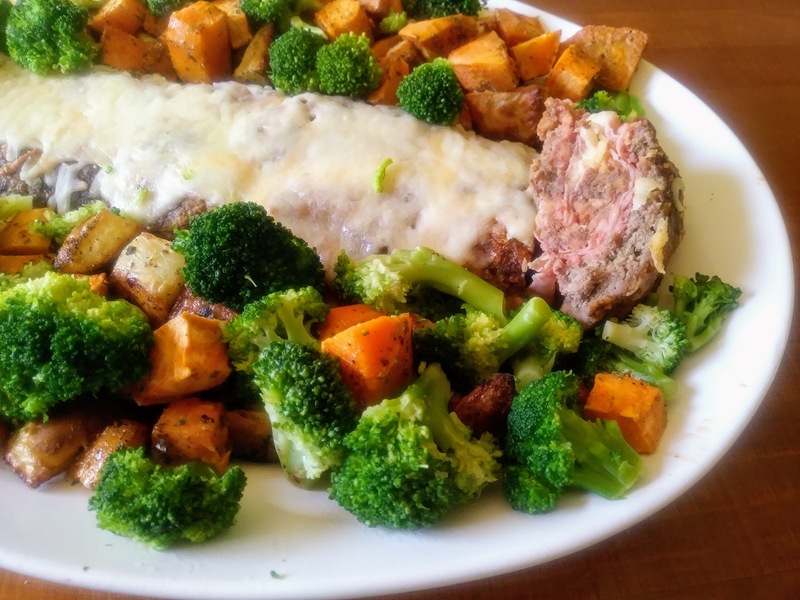 This is a delicious meat loaf that is company worthy or just for your average Tuesday evening supper. Serve it with roasted vegetables and you are good to go. The leftovers are awesome too. Combine the first 8 ingredients. On a parchment or foil lined baking sheet spread the mixture flat into a rectangle. Layer with the ham, then 1 cup of cheese. 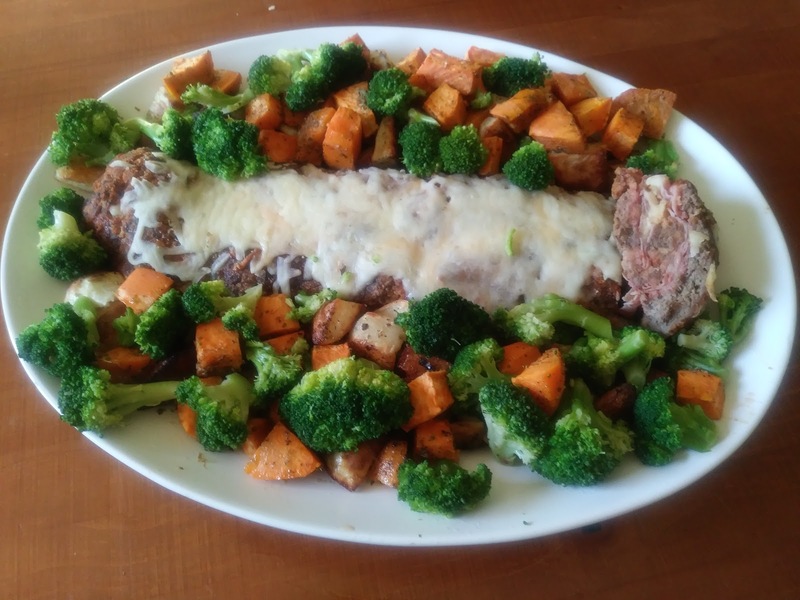 Roll up the meat into a log. Peeling away the foil or parchment. Bake at 350 for 60-75 minutes. 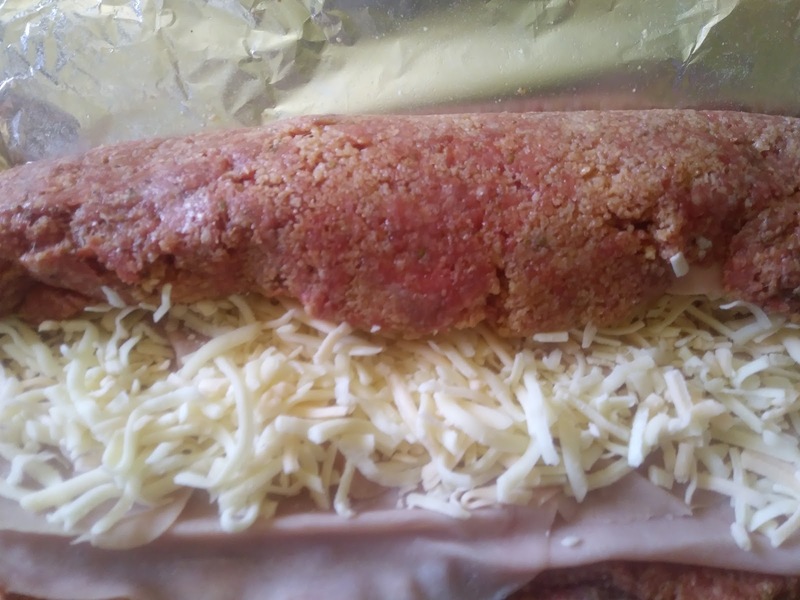 Top with a 1/2 cup of cheese the last 5 minutes of baking time. Slice and serve. Makes enough for 8 servings. Now that Valentine's Day is behind us and we've all had our fill of sweets, I'll pass along our favorite recipe for ribs. I have no idea where the recipe originated but have been using it for years. I normally serve it with 'golden mashed potatoes' but never thought to take a photo until after the meal, so the potatoes did not show up for the photo shoot! Place ribs in large roasting pan with about ½ inch of water. Cover and bake at 350° F. for 1 ½ hours. Drain water from roaster. Combine remaining ingredients to make sauce. 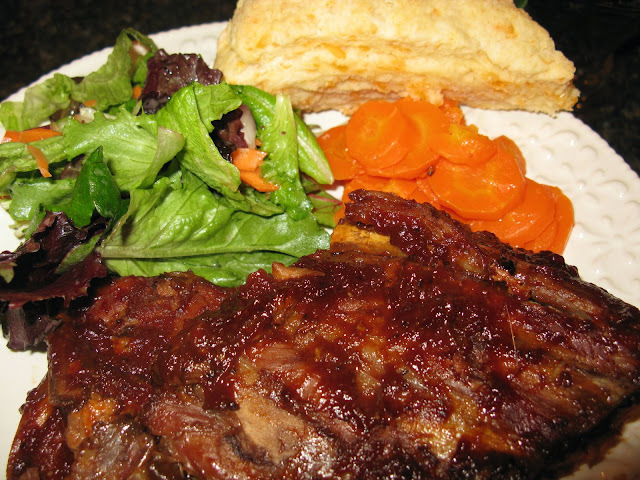 Pour over the ribs and bake for another ½ to 1 hour, basting ribs occasionally with the sauce. Today after church we enjoyed a Sunday Brunch of an oven baked omelet and salad, that ended with a puffy apple pancake also baked in the oven. The origanal recipe that is posted is baked in a 9" pie pan, but I doubled the recipe and baked it in a 9x13"pan. Place butter in pie pan and melt the butter in the oven. Thinly slice apple and when butter is melted arrange apples in to the pan. Carefully pour into the hot pan. Sprinkle with brown sugar and extra cinnamon if you desire. Bake for 15-20 minutes or till puffed and golden. The pancake does fall after it is removed from the oven....no worries. Serve with maple syrup, or a sqeeze of fresh lemon. A few years ago, I purchased some 6 ounce ramekins for individual desserts. They make the loveliest individual portions. . .all neat and tidy, no worry about "serving mess" catastrophe's. I found this recipe in The Fine Cooking Magazine Special Annual Issue of holiday Baking. ..2003. I was surprised to find the whole recipe on the link. 6 ounces bittersweet chocolate. I used leftover chocolate from Christmas and put it on a kitchen scale to weigh it. . .
Lightly butter 6 ramekins and then dust them with the sugar. . .pour the sugar into the first one. . and then dump the remainder to the next. . .and the next. . adding a bit more sugar if needed. Set the ramekins on a baking sheet. Stir together the water . . .and the instant coffee. Set aside. Melt the chocolate and butter in the microwave. . .ten seconds at a time until the chocolate is softened. . .stirring well in between.. . .or use a large bowl over a pot of boiling water. Whisk until glossy and smooth. Stir in the coffee mixture and the salt. . . and whisk in the egg yolks, one at a time. Add about 1/3 of the icing sugar and whisk until well blended. Set aside. Beat the egg whites in a freshly washed and dried glass or metal bowl. Add the remainder of the icing sugar just when the whites are foamy and then continue to beat until the peaks are firm and glossy. Spoon about 1/4 of the whites into the chocolate mixture. . .stirring well. . .this lightens the heaviness of the chocolate. . allowing the remainder of the whites to be mixed in without deflating them. Add the remaining whites. . .gently. . until just blended. Pour evenly into the ramekins .. .and chill uncovered about 30 minutes. Then. . cover with plastic wrap. The delay in wrapping helps the wrap not to stick to the chocolate, ensuring a nice smooth baked top. If you want to bake them within 24 hours. . .leave them in the refrigerator and bake them on a cookie sheet at 400 degrees .. .for 15 minutes. If you want to make them ahead. . .put them in the freezer. . .and remove them while you preheat the oven at 400 degrees. Bake them on a cookie sheet for 20 minutes. Serve hot from the oven. . .immediately. A little garnish of berries and whipped cream or Ice Cream on the side. . .is a perfect addition. Though the recipe instructions seem long. . .it is truly a breeze to make. This recipe takes me back to my school days, when my mom packed my lunches. I also made these for my kids’ lunches even though sometimes they used them as valuable trading food for fruit roll ups and snacks I deprived them of. The icing hardens enough so that you can wrap them with plastic wrap and it doesn’t stick to it. I like them because they don't fall apart like the chocolate cake mix cupcakes and the first ingredients is not sugar. . . well looking at it now, it's listed first on the recipe but . . . you know what I mean. Whisk sugar and eggs well, gradually beating in the oil, then the buttermilk and vanilla. Bake at 350° F for 20 min. Remove from muffin trays and cool on wire rack. Ice with chocolate icing once cooled. Mix 1 1/2 cups icing sugar with 2 tablespoons soft margarine, 1 tablespoon cocoa and enough milk (maybe 4 tablespoons) to make a spread-able consistency. Sprinkle with chocolate or colored sprinkles. Freeze in air tight container once the icing has dried. 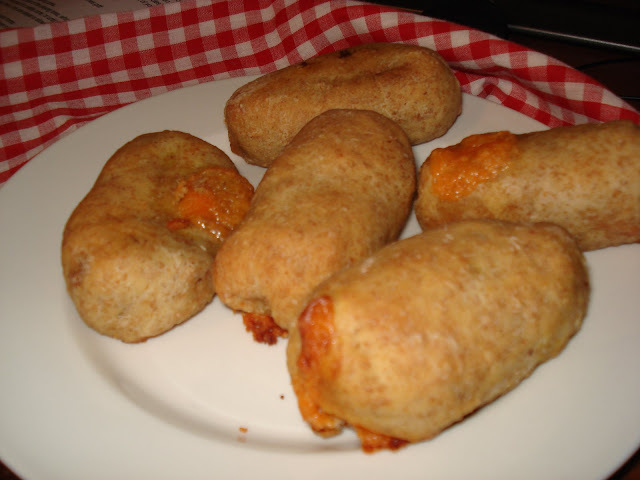 Years ago I saw this recipe in a magazine, it is the most simple recipe I have ever made. The magazine was called 'Home Sweet Home' from the publishers of Family Circle. These cookies are delicious and it's hard to believe how easy they are to make. A fun recipe that even smaller children can manage! Roll into 1 inch balls and place on a baking sheet and press each cookie with a fork. Bake in 350º oven for 10 to 11 minutes. You would think that just once. . .before eating these. ..I would remember to put them in a nice decorative basket for the picture op. . . I've been making these fairly regularly and really like the ease of pulling dough out of the refrigerator with an hour to spare before dinner. The dough will last up to 2 weeks well chilled. . .if you don't eat all the buns before that. I am using my kitchen aid mixer. . .but you can use a big bowl and a sturdy wooden spoon. Put your water, salt, honey yeast in a large bowl and stir together. Add the multigrain flour. . stir it in. Add the white flour. . .stir hard. . or use your mixer. Plop it all into an ice cream pail with a few layers of plastic wrap on top. Put the lid on but leave a bit of airspace. Put the bowl in the fridge for a day at least or up to 2 weeks. When you want to bake buns, break off a piece the size of a large grapefruit. Roll it into a cylinder the length of a cookie sheet. . .making each end a bit pointed. Take your clean kitchen scissors and at 1 1/2 to 2 inch intervals cut right down at an angle. ..through the cylinder, laying them down to the side. Continue down the row, laying the buns back and forth. Bake the buns at 450 for about 20 minutes. If you want crustier buns, pour 1 cup of hot water into a broiler tray below your bun sheet. This cake in a mug was fun to make! The cake is slightly dense but quite delicious served warm with a scoop of ice cream or whipped cream. Sounds like an idea for Valentine's Day. Recipe from my long time friend Em. Mix together dry ingredients in the mug. Place mug in microwave (1000 watts) and cook for 3 minutes. The cake will rise over the top of the mug but don't be alarmed. Allow to cool a bit and tip out on a plate if desired or eat right out of the mug. I have made this cake for at least 25 years for many a shower and birthday cake. The icing works great for spreading and decorating with. You can add food color to it and use the star tip or writing tip for easy decorating. Beat butter and cream cheese, gradually adding icing sugar until desired consistency for spreading. To use with a decorating tube, you may need a little extra icing sugar. 2) Cool 10 min. Invert onto cooling rack, remove paper. Cool completely to decorate. *To frost sides and top of cake, double the icing amount. For my sister’s birthday last week, I used this recipe and decorated it with dried pineapple flowers. The instructions are with the hummingbird cake previously posted. I snipped this banana cake recipe from a farm publication called The Western Producer not too long ago. It is great served with warm caramel sauce and a scoop of vanilla ice-cream. Stir in dry ingredients and mix until blended. Pour into a greased nine by thirteen inch pan...or two nine inch round cake pans. Bake at 350 degrees for about 45 minutes...or until set in centre. Add sugar; cook until melted, stirring occasionally. Stir in sour cream and cook for 1 minute. I have also used this cake as the base for my grandson's birthday cake. 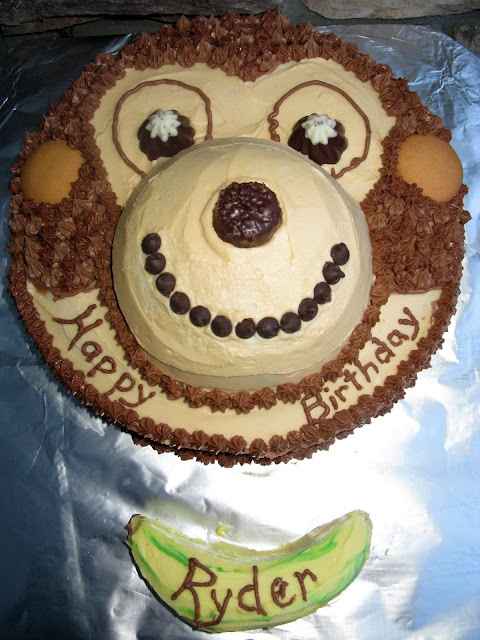 What could be more appropriate for a monkey cake than a moist banana cake recipe? I'll post instructions for the monkey cake below. For my grandson's first birthday I made him a monkey cake...complete with a tiny banana which was his 'smash cake'. He turned three not long ago and requested a repeat of the monkey cake. I found the banana cake recipe works perfectly for this cake. Mix as per instructions above...and then bake in a 10" inch springform pan and a small round Pyrex bowl (for monkey nose). I also made one mini loaf, that I carved into a banana shape. This frosting spreads and pipes smoothly. 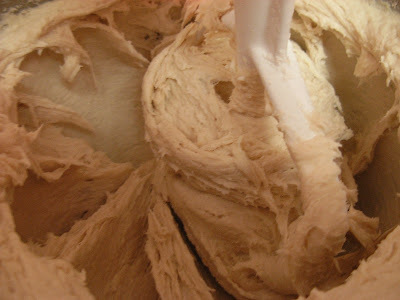 Butter should be soft to prevent the frosting from splitting when tinted. Alternately, beat in sugar and creamin three additions of each. Remove a small amount of icing to be tinted yellow...for small banana cake. Divide remaining frosting into two bowls. Tint one portion a skin-tone. Add 2 squares semi-sweet chocolate (melted) to remaining frosting. Center round cake on prepared base, allowing enough room for small banana cake below. Position nose on monkey's face and glue in place with frosting. Put a skim coat of skin-toned icing over entire cake, with a somewhat thicker layer over face area. Position vanilla wafer for ears. Use frosting bags and decorating tips to apply chocolate icing. I used assorted chocolates for the mouth, nose and eyes...but use your imagination! Frost tiny banana 'smash cake' with yellow icing and add a few green streaks with toothpick. Try this recipe to make a little something for the family to take along for their work / school lunches. I made the dough a little higher in fiber, used low fat cheese and low sodium farmer sausage. You can try turkey sausage or garlic sausage. Really any sausage you have on hand can be used. add water and incorporate well. let dough rest about 20 min. flatten out each piece of dough and put in a little mustard, a piece of sausage and cheese. fold up sides and pinch the seams together, place seam side down on a parchment lined baking pan. some cheese tends to melt out and it makes for easier clean up. let rise about 1/2 hour. bake at 375 for 25-30 minutes. 64 sounds like a lot, but the kids have them polished up in no time! When I saw a picture of this cake, I had to try it and if you have any reason to make a cake for a special occasion in the near future, this is easier than it looks. I got the recipe from Danielle, a dear friend of my daughter, who made it for her little girl’s birthday. 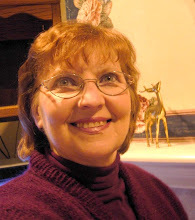 Danielle, whom I admire for her creativity and ability to make things beautiful, gives credit to Martha Stewart. Beat butter and cream cheese until creamy. Gradually add sugar , beating until right consistency for spreading. Can be refrigerated for several days. bring to room temp before using. Preheat oven to 350 F. (rack mid level) Grease two 9 x 2 inch round cake pans. Line the bottom with parchment or wax paper. 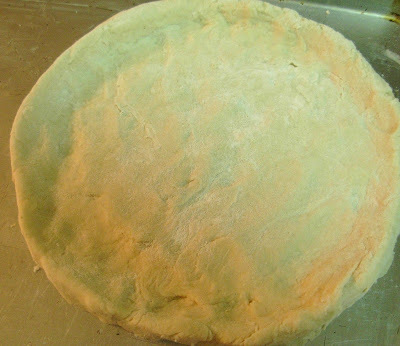 Grease paper (if using wax paper) and sides of pan, then dust with flour, tapping out any excess. Set aside. In a large bowl, beat eggs, sugar and vanilla well, stir in oil until combined. Beat until mixture is pale yellow and fluffy. Add bananas, pineapple, coconut and nuts, stirring until combined. Add flour mixture, blending well. Bake until golden brown and cake tests done, 30 - 40 minutes. With serrated knife, trim and discard rounded top off one layer. Place layer on serving platter. Spread top with ¼ inch of frosting. Top with untrimmed layer. Frost sides and top of cake with remaining frosting. Decorate with pineapple flowers. Preheat oven to 225 F. Line two baking sheets with parchment paper. Slice off top and bottom of pineapple. Standing pineapple on end, peel off sections, cutting in a downward motion. Trim to remove eyes or use a small spoon to scoop. 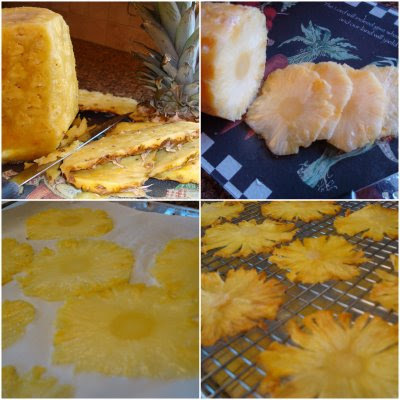 Slice pineapple into very thin slices and place on baking sheets. The thinner you cut the slices, the faster they will dry and the brighter the color will be. Bake until tops look dried, about 30-40 minutes. Flip slices (at this time I cut some indentations into the sides so that the petals would be more exaggerated) and bake until completely dried, about another 20 minutes. I used convection bake which has a fan on it, and that worked well. You can also put them on a cooling rack in the oven for the last part of drying. Cool on rack. You can make these ahead and store them in a muffin tray – slip into plastic bag and refrigerated up to three days. These small rolls taste wonderful and if you taste one still hot from the oven dripping with glaze I dare say you won't eat only one! 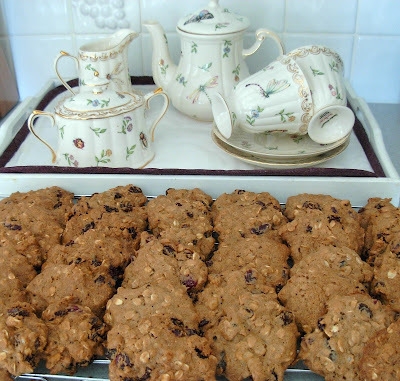 I first tried this recipe many years ago and it was a always a hit whenever I served them. Tonight I am serving them as a dessert for our supper guests! Add cream and mix with fork till you can handle the dough and forms into a ball. Cover dough and refrigerate for 1 or 2 hours. Roll out, not too thin and cut in squares. 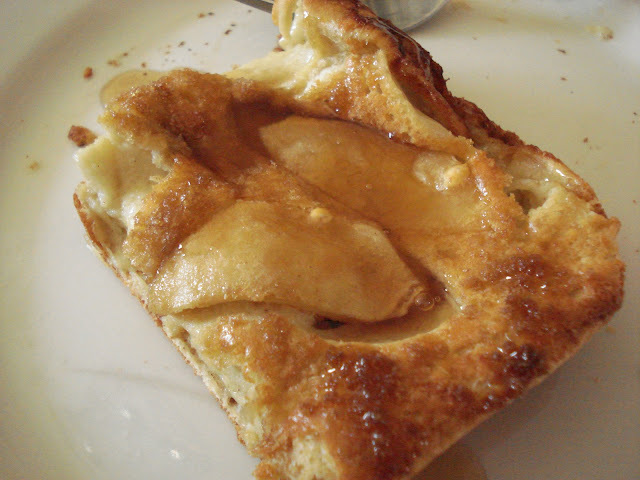 Place an eighth of an apple on a square of dough and roll them up placing them on the pan. To make them look a little 'fancier' I place the apple piece diagonally on the square of dough and bring up 2 corners and pinch them on top. Bake at 400º for 17 minutes or until golden in color. Mix and brush on the apple rolls while they are still hot.